I went through a tiny Hunter S. Thompson phase right out of high school, as super serious oh-so-cynical teens must. 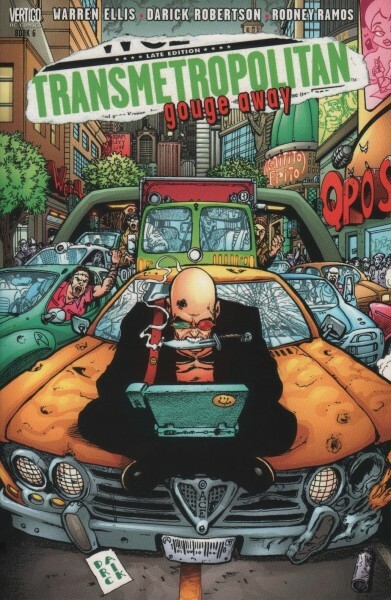 It inevitably led to reading each volume of Transmetropolitan. Warren Ellis' sci-fi political satire... thriller? Comedy? It's a strange blend of hyper-stylized Hunter S. Thompson-style political commentary and Terry Gilliam futurescape. There's a kind of timeless quality to it, I recently glanced back over it, it holds up. For obvious reason. The messages are pretty universal, its relevant as long as human nature remains the same. The same fears, the same wants, the same troubles. 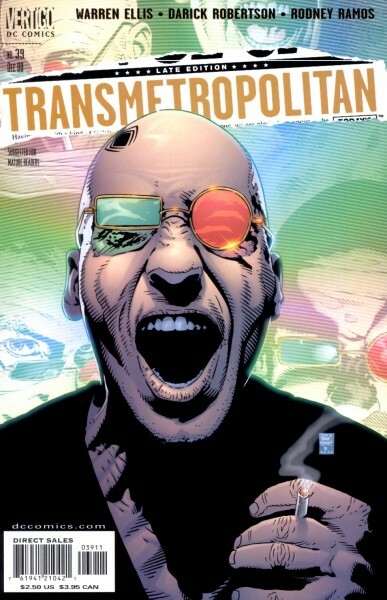 So in this age of every comic getting its own time to shine, where is Transmetropolitan? Look, Preacher is getting an adaption. It's not like "Transmo" is any weirder or... adult-er. They're comparable. There's not that much more that they'd have to censor. Or, hey, forget censoring. I know everyone everywhere now wants their favorite thing to be a Netflix series, but TRNSMETPTN would work great as one. Like a more effects-heavy House of Cards. With more swearing a mutant cats. And soiled pants. Everyone seems to agree nowadays that politics are a joke. Would this not be the perfect time for something like T-met? At one time I could see people thinking it was too cynical for mainstream consumption, but it seems everyone from all walks of life are kinda of dissatisfied with the system. Is it just my own personal taste? Maybe the book is too much "for me", maybe it's still too out there for adaption? I don't know. I would have said the same thing about Preacher and, as I mentioned, we're getting one of those. Though, they seemed to have changed a bunch, so, I guess... that means something. Studios are scrambling for material and, thanks to Deadpool, they seem to be scrambling for R-rated material. Now's the time to bring TMPT to the public. Hopefully in some kind of serialized fashion. It just so strange to me that this hasn't happened yet. Am I wrong? Has the book already had its day? Is it too heavy handed for today's discerning public? Let me know in the comments below.